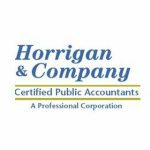 Horrigan & Company CPA’s, P.C., is a full-service CPA and financial planning firm that provides a number of services in addition to the traditional tax and accounting services. They specialize in business & personal tax planning, new business & entity planning, business consulting, bookkeeping, as well as QuickBooks training, customization, and support. Company Horrigan & Company CPA’s, P.C. Work For Horrigan & Company CPA’s, P.C.? Claim This Page.